Every few years or so, young women and girls everywhere find themselves head over heels for a someone or something in the media. Once there was Elvis, and The Beatles, Brad Pitt and Jared Leto. These are names and faces that have driven girls of all ages totally crazy. The heart throb du jour has taken the form of books and movies, with the immense success of Stephenie Meyer’s creation, Twilight. When I sat down, skeptically, to watch Twilight, I was surprised to find that I didn't hate it at first. I was even more surprised to learn that much of the jewelry worn by the cast was created by an Etsy design team. Sisters Silvija and Taya Koschnick of Tasi Designs started out like many of us did. Today, they enjoy the immense pride that must go with having your work chosen for a major film’s wardrobe. After reading a Beading Daily blog post about the gorgeous simplicity of the jewelry from Tasi Designs, and how it made it onto the big screen, I felt a boost of vicarious confidence. If these two gals can do that, just imagine the possibilities for other beaders and jewelry designers out there. I was immediately inspired to create something that had the same elements of simplicity, plus some of the sensuality that goes along with a romantic vampire movie. For this project, I chose some deliciously dark reds from Artbeads.com to start with. Black lined garnet 3 cuts had exactly the right tone that I wanted, and the coral AB 8o hex beads added a splash of sassiness. 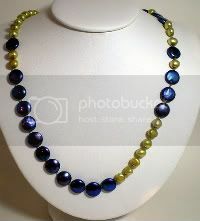 I also included some navy lined yellow seed beads. The finish has a sort of magical quality. At first glance, they look like regular blue lined crystals - then a sudden flash of yellow adds an entirely new layer of interest. 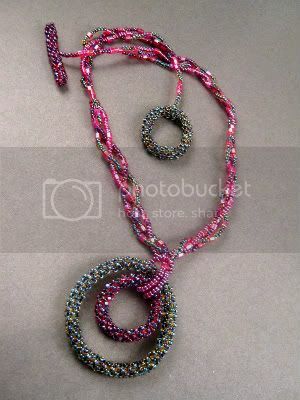 For a pendant, I made two right angle weave hoops of different sizes, using the color lined beads. 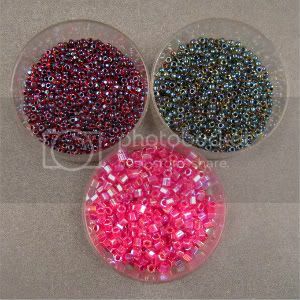 I then lashed them together with some transparent red seed beads. For the necklace straps, I braided strands of seed beads and hexes, and finished them with a hand stitched hoop and toggle clasp. The necklace is really fun to wear, but I don’t think I’ll be making another. Braiding loose strands of beads is a task for someone with far more patience than I have. Next time, I’ll stick to stitching. The deadline for ordering kits for the USE THE MUSE II beading contest is coming up this week. Not only does this mean that it’s nearly time to submit our creations, but it’s also time to reflect on how we’ve used the muse. For my project, I used nearly all of the beads in the kit, and added some from my own stash. 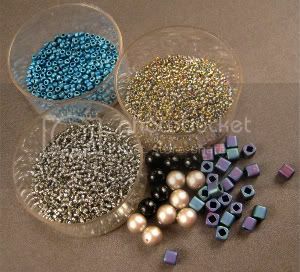 I chose some gorgeous abalone lined crystal 11o seed beads, matte blue AB 60’s, and silver lined aqua 15o’s from Artbeads.com. After the ‘Big Reveal”, I’ll show just how these selections from my stash measured up against the Muse. Although I’m really pleased with my creation, the leftover components from the kit had me wondering what other combinations I could have made. So, I pulled out all the bead boxes in my cupboard and put together a few examples of the beads not taken. 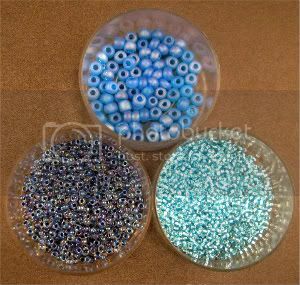 This is a second example of how the blues in the Muse kit can be paired up with additional blue beads. 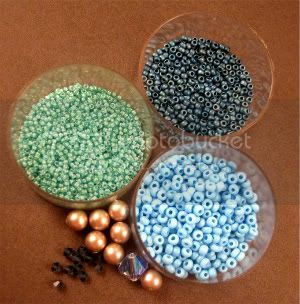 The Swarovski pearls and crystals, and the 11o seed beads look bold and fresh against baby blue 8o’s and jonquil lined aqua 15o’s. The purple-blue silk ribbon provides a lovely background for crystal AB bugles, white Ceylon 11o’s and pink lined blue 6o’s. 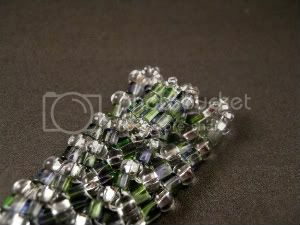 For something completely different, I placed silver lined violet and transparent green mix seed beads against the deep blue Muse kit beads. The combination looks so lively and tropical. This collection is my personal favorite. I love the deep muted shades of the platinum pearls, cubes and seed beads, with gold lined black diamond 15o‘s, silver lined gray 15o’s and jet black druks. I’m really looking forward to seeing all of the USE THE MUSE II entries, and the many combinations of beads and components that everyone used. For more information about the contest, visit TheBeadersMuse.com. Recently I was in desperate need of a button for a bracelet closure. With only one Swarovski button in my stash (that didn’t match my project), I decided to make my own. Using cube beads, I made a little square stitch rectangle that I could stitch to the beadwork just like a button. Since then, I’ve been thinking about square stitch more and more. It’s not a technique I use much, but the easy way the cubes came together was kind of refreshing. So I tried to think of some ways that I could incorporate square stitch into my usual projects. I started with some new 8o Hex seed beads, which I thought would work well with square stitch, plus give a little extra sparkle. The transparent leaf green AB shade has a nice summery look - a sort of pick-me-up for the unbearably hot days to come. 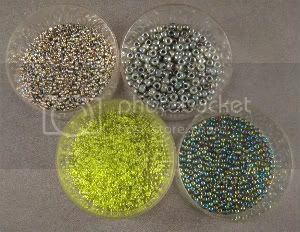 I matched the Hexes up with 11o seed beads in white lined peridot and yellow lined crystal, from Artbeads.com. The special shine that the lined beads have goes really well with the AB hexes. I’m really taken with the white lined variety in particular. I started by making a simple square of hex seed beads to use as a pendant. I decided to suspend it from a V-shaped St. Petersburg chain, and added a little matching fringe. Although I’m really pleased with the way the homemade pendant turned out, I find that the necklace straps really overpower it. Next time, I think I’ll choose a more subtle stitch for the chain, and let the square pendant stand out. The multi-strand necklace was the very first beading/jewelry technique that I ever learned. I was working at a bookstore at the time, and a beading kit ended up on the clearance table for 75% off. 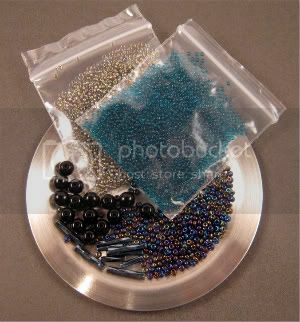 I scooped up two of them, with the idea of using the beads for crafts. I didn’t expect the actual project to be so appealing until I opened the kit and saw how easy it could be. That year, nearly everyone received multi-strand necklaces for Christmas. 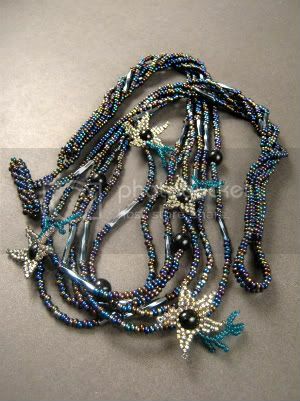 Multi-strand necklaces are wonderful because it’s almost like bathing yourself in beads. The way the strands flow and drape is unlike any other style of necklace there is. I haven’t made any multi-strand pieces since giving up metals, and I’ve really been missing them. 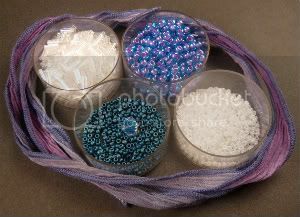 So I set out to find a way to create a lovely shower of beads without the use of eye pins. For this experiment I threw together a mixture of interesting shapes and colors to inspire a really unique multi-strand necklace. I chose heavy metal rainbow mix seed beads, gunmetal twisted bugles, jet black Czech druks, and gold lined black diamond 15o’s. 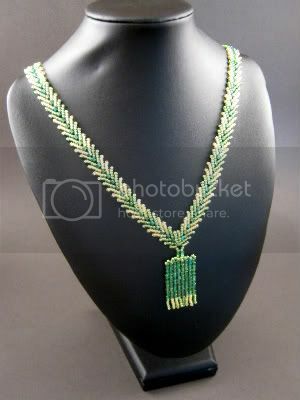 I replaced the traditional eye pin, bead cone and clasp necklace ends with short herringbone tubes. 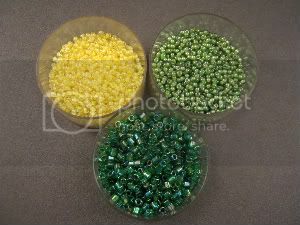 These became the base for a beaded clasp as well as the individual bead strands. For fun, I used brick stitch to turn the black druks into tiny little flowers, adding some green fringe for leaves. I’m pretty happy with the results of my experiment. I can see using larger beads for the herringbone tubes, allowing for even more bead strands without increasing the size of the tubes too much. I really prefer the beaded clasp, since it means there are no wires to bend or jump rings to fiddle with. Simplicity is good. Although nearly everyone has a favorite color, I think most beaders and other artists have an entire palette of colors that they love to use. And then there’s ‘that’ color. The one that we are continuously drawn to for reasons we can’t explain. It’s usually a color that we hoard, not only because we love it so much, but because we just can’t figure out what to match it with. My ‘that color’ is chartreuse. Just try and stop me from buying beads in bright yellow-green shades. I can’t explain my obsession, and I’m always left scratching my head, wondering what to do with the beads when I have them. 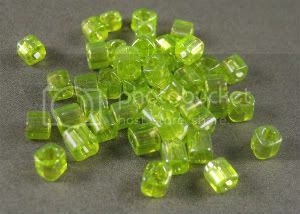 Recently I purchased some lovely rainbow lime 4mm cubes. After I spent some time admiring them, I brainstormed ideas for putting them to work. A flat piece like a herringbone bracelet seemed too obvious. Because of their size - bigger than seed beads but still tiny - I thought it would be nice to do something delicate with them. I decided to flip through some old beading magazines for ideas. 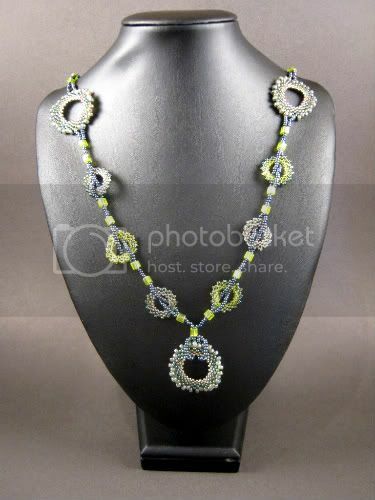 I came across a stringing project from the August 2006 issue of Bead & Button. I remember being really taken with Julia Gerlach’s multi-strand shell donut necklace. The design seemed like a perfect way to show off my chartreuse cubes. I only had to come up with a way to do it without wire, crimps or shell donuts. Along with the lime cubes, I grabbed some lemon-lime and gold-lined black diamond 15o Tohos, moss green AB 10o’s, and green Picasso 8o’s. I liked the way the four colors seemed to flow into one another. Any two would have made a great pair of colors, and the whole set seemed to fit just so. I used circular peyote stitch to create my own set of donut ‘beads’ - 12 tiny ones and four large. Instead of stringing everything together with a clasp, I created the top and bottom halves of the necklace separately, and used two of the large donuts to weave off the threads. With only one packet of moss green 10o’s, I didn’t have quite enough to assemble the necklace with, so I grabbed some gunmetal 10o beads instead. I love the way they make the chartreuse beads pop. Although I am a little sad to see my precious cubes go, I’m very happy with the results. As beaders and jewelry designers, we are blessed with an incredible range of materials to use when channeling our creativity. Though many of us find our niche and stick with it, we can still learn from each of our peers, and admire their own unique style. Although PMC is taboo for me, I am always amazed by the incredible pieces of art jewelry that can be transformed from a bit of clay. 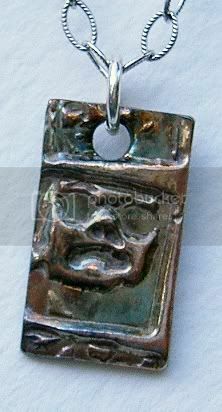 Imagine being able to create your own charms, clasps and beads from the comfort of home! One of my favorite artists is Paula Atwell. Her designs combine silver, precious stones, and glass with inspiring shapes and images. Paula has been a professional artist for 15 years, and is the owner of Lake Erie Artists Gallery in Cleveland, Ohio. Inspirational Beading: How did you first discover art jewelry? Paula: I started as a beader. 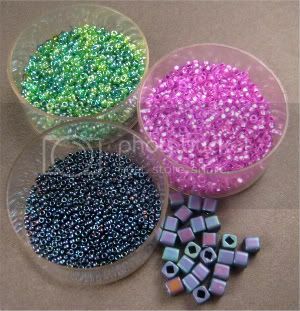 I was looking for something that I enjoyed doing and found a class on beginning beading. I was hooked from the first class. I loved the beads, designing the jewelry, and creating the pieces. Of course, none of them were symmetrical, and mine were different from anyone else's, but that’s me. IB: Necklaces or bracelets? Do you have a preference? Paula: I prefer making necklaces because I don't like to have to deal with sizes but I have learned that jewelry seems to go in and out of style. One year earrings will be super popular, then the next it will be necklaces, and so on. So I make them all. Paula: I am primarily into making organic looking designs, and get most of my ideas from the colors and lines of nature all around us. I do a lot of designing in my head and also right while I am working with the materials. I just know when I find something that I like. Paula: I used to look at magazines a lot and catalogs to get some stylistic ideas, but now I just find the materials that I like, and mix them up until I end up with something that works for me. Most of my designs combine colors and textures. 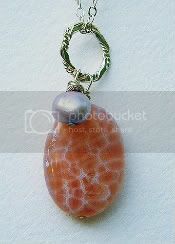 For instance, I love to match pearls with rough stone, and metal. Paula: Honestly, I hope to continue to inspire myself and my children to grow as artists, and to allow people to have some freedom to express themselves with their style and look. Paula is also a watercolor painter, and a freelance author. You can find much of her work around the web, including Squidoo and Zazzle. 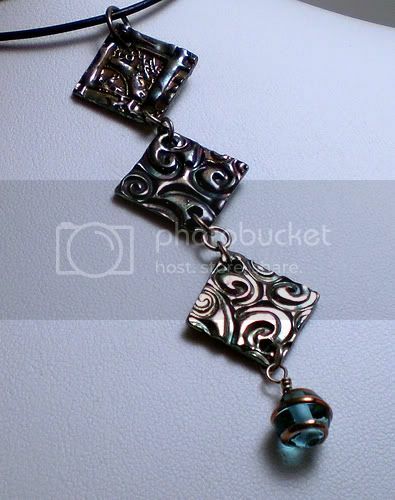 If you’re interesting in creating your own PMC jewelry, check out her PMC Metal Clay Tips and Tutorials.